First, let’s introduce you to the readers. Who are you? Hi! I’m Josh, and I’m the founder of Studio Élan. 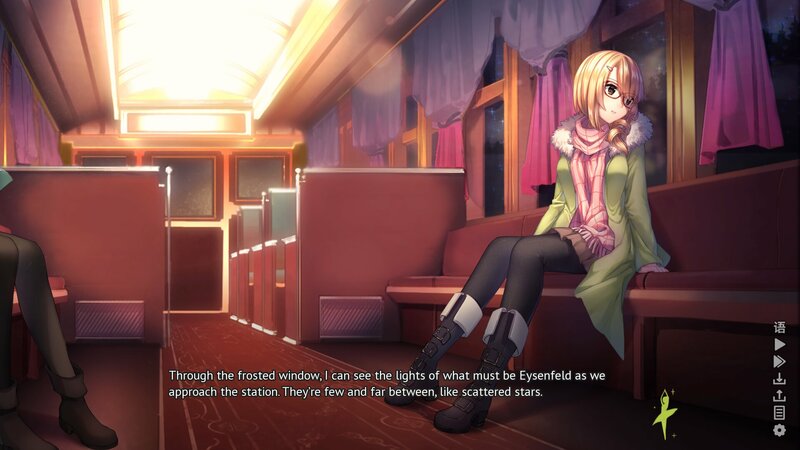 I was one of the co-creators of the yuri visual novel Highway Blossoms, which was released by another dev team I’m part of – Alienworks. I live on the East Coast of the US and really like Love Live! Sunshine!!. Forming Studio Élan and making games about girls loving girls. What motivated you, and when did you decide to make it a reality? Especially in the West, I feel like yuri is very underrepresented compared to otome and bishoujo games. 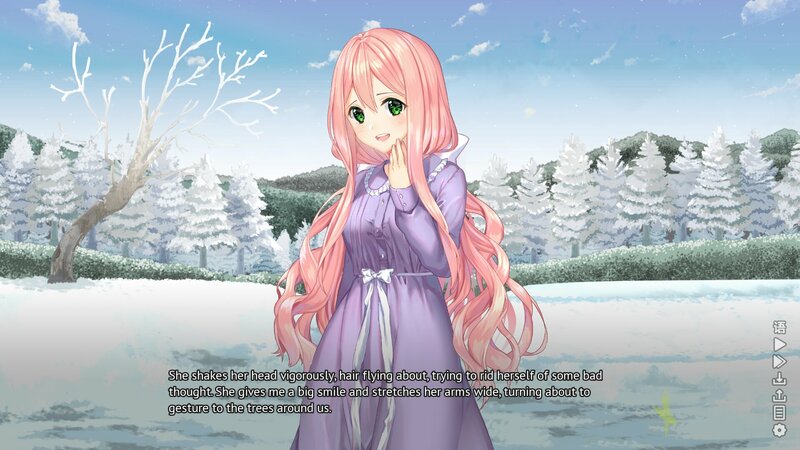 There aren’t a whole lot of groups that make exclusively yuri games. Instead, most dev teams work within a variety of genres – including Alienworks. We started Highway Blossoms in 2014 and released in 2016, and were fortunate enough that people really enjoyed it. In late 2016, I decided to start Studio Élan because I wanted to build a brand and identity specifically within that genre, as well as the fantasy genre. We’ve been working hard on that dream ever since! You previously worked on Highway Blossoms, an amazing read if I do say so myself. What do you take away from the experience and use in Heart of the Woods? I think one of the most important things was just gaining familiarity with “the process.” I’m a writer, not an artist or musician or programmer, so prior to HB and HRP (the other currently in-progress game from Alienworks), I didn’t really have a clue about how those things worked. Now having been through it, I feel like I have a better understanding of what’s expected from me by the rest of my team and how to make it all work. It also helps figure out what a reasonable budget, time frame for development, and marketing plans are. On the creative side of things, HB was kind of a blueprint for the “style” of yuri game that we want to make: tasteful and cute. 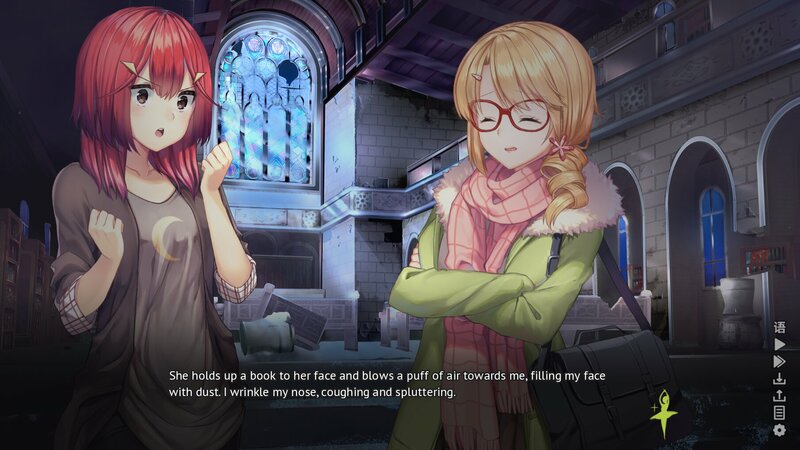 Heart of the Woods is about investigating the paranormal. How many ideas did you have to go through before deciding this one was the one? Oh God, we went through a few. Originally, the premise for the game was entirely different. We had the same core cast of characters – Maddie, Abby and Tara – and their personalities and designs were the same. But instead of a paranormal investigation in the woods, it was a time travel story set in a little college town. We actually spent a few months on that idea, going through several different iterations trying to make it work, before we scrapped it. We just kept running into plot holes or having trouble making certain parts interesting, so we decided to start from scratch. The main thing that we wanted to keep, aside from the characters, was the “love across time and boundaries” theme for the romance. In the original idea, Abigail came from a time 200 years before Maddie’s, but they were able to communicate via letters. That turned into the current situation, where Abby’s a ghost who’s been dead for a couple centuries before she meets Maddie. Maddie, Tara, Abigail, and Morgan are the stars of this tale. Can you tell us who you used as a base for designing the cast? Maddie was the first one we designed. We settled on some elements, like her hairstyle, really quickly. Others, like her hair color, changed a few times. For a long time, she was a brunette. Her original outfit was more suited to the sunny weather that the college town setting called for, although we kept stuff like the color palette the same once we had to change that. For Abby, all I knew was that I wanted her to wear a long, purple nightgown. Her hair and other features came about after trying a few different options. She also started the unintentional Studio Élan trend of having pink-haired, green-eyed girls: Abby, Maera from The Waters Above, and our mascot character Melanie all fit that description. Plus a character from an unannounced game that we’ve been working on. Let’s talk art. Rosuuri, anckp, and Huixcia teaming up for the project. What was it like working with them? Rosuuri’s been one of my favorite artists for years. Before I got seriously into visual novel development, I remember seeing some of her artwork on deviantArt and imagining how cool it would be to work with her someday. I had the privilege of working with her on both HRP and Highway Blossoms, and hopefully lots of future games too! Her art’s consistently gorgeous and eye-catching, and it’s a huge part of what I think makes HotW special. Our background artists are wonderful too! Huixci joined the project later on in development, but she’s consistently been super clutch. One of my very favorite backgrounds is the one she most recently finished – Morgan’s antique shop. It’s so detailed and fun, I’m sure everyone else will love it too. anckp was one of the first people brought on to work on Heart of the Woods, and was incredibly enthusiastic about it. Really diligent and reliable, he’d do a ton of revisions and hard work to make sure his pieces matched his vision for the game. I know a few people, myself included, are curious about the naughty bits. What was the talk with Rosuuri like when designing those scenes considering it was her first lewd rodeo? It went really smoothly! Rosu’s very much a pro, and I think she was just as excited about trying something new as we were. Generally speaking, we give her write-ups of what the images should be. It’ll include stuff like which characters are doing what, where they’re located, and sometimes stuff like what the angle should be, or where the “camera” should be pointed. Other times, we’ll just tell her the tone of the scene and what needs to happen in the picture, and let her figure out the composition itself. For the lewd scenes, we gave her pretty specific instructions. Sound design is usually the unsung hero. What was setting the ambiance like for each scene? Did you know what you wanted from the start or did ideas flow in the process? Towards the start of development, before most of the script was drafted, I wrote up a big list of what I hoped would be all the songs that we’d need for the game. Some really important moments would get their own special songs, while others like character themes would be more general use. I also specifically wanted to make use of leitmotifs – melodies that come up in multiple songs to represent certain elements, like snow or the forest. 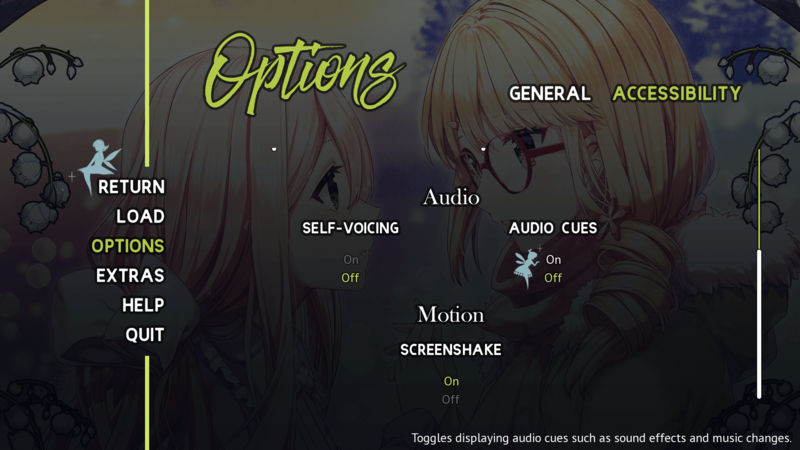 Once it comes to implementing the music, aside from the scenes that have unique songs, it’s more about choosing the most appropriate track from the whole list of options. That pretty much happens as we go along. As far as ambient noise goes, there’s a lot of atmospheric sounds that you can expect from a spooky, snowy forest at night, so I hope we conveyed those pretty well. We’re also big fans of using total silence (or at least muting the music) to give dramatic weight to certain parts, too. Two years of development and we’re two weeks away from release. Has the feeling sunken in? Do you plan on celebrating the launch with the team? Honestly, it probably won’t really sink in until we’re hitting the “release” button. Maybe even not until after that. Right now we’re still in the stage of last minute fixes and implementation, so the game isn’t quite ready to go yet. Once that’s done, then maybe it’ll finally feel real. As for a celebration, we’ve been talking about possibly livestreaming a developer playthrough or something leading up to the release. We’re spread out all across the world, which can make it a bit difficult to get everyone in the same call or channel at the same time, but I hope we can make it work! Everyone on the team has worked incredibly hard on this game so I know we’re all looking forward to enjoying the launch. Were there any features missing from the game due to some sort of constraint? If so, do you plan on adding them later? There were a couple scenes that we removed or shortened, as well as some planned art pieces that got cut due to either time or budget. At some point, if the game does well enough, I’d like to do a “Director’s Cut” edition, similar to the “Remastered” version of Highway Blossoms. Also just like HB, we never specifically planned to include voice acting, but it’s something I’d really like to add in the future. 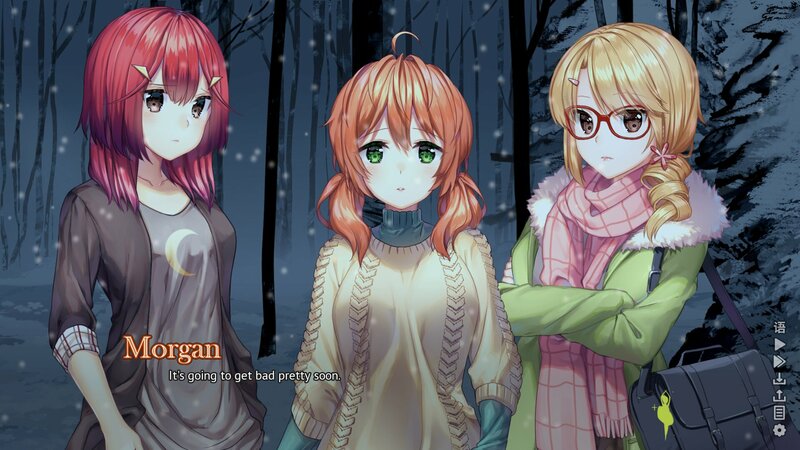 Heart of the Woods also features a really cute ghost. What do you have to say to anybody on the fence about buying Heart of the Woods? Try the demo, it’s free! More seriously, I do think that readers who aren’t usually fans of yuri games, or at least who aren’t particular fans of it, could still enjoy the game. 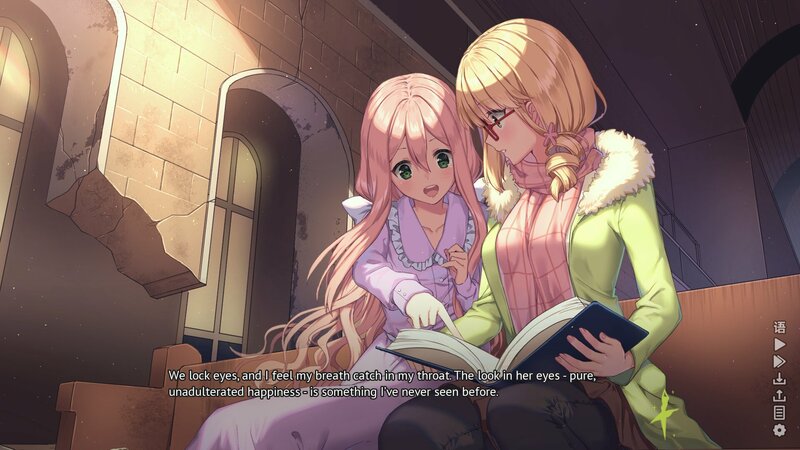 To me, Heart of the Woods isn’t a romance game with fantasy elements. Instead, it’s a fantasy game with romance elements. We’ve got magic and fairies and ghosts and all sorts of stuff like that; we really wanted to tell a good, fun story first and foremost. It’s also got stunning art and a stellar soundtrack, so in my opinion, the game is worth picking up for those alone. 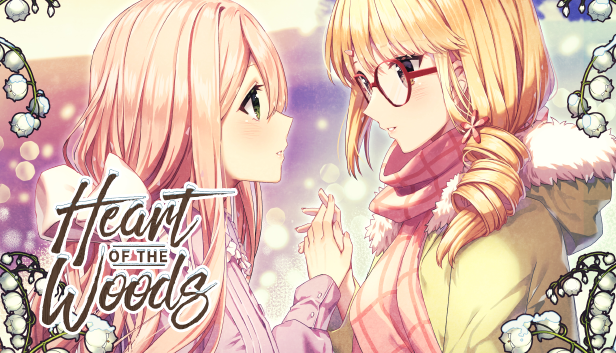 Every single part of Heart of the Woods was made with love, by people who are truly excited to be working on this game. It’s not just my vision, or any one person on the team’s vision – it’s something that we all made together, and I really believe that the passion we put in make it something truly great. Will we see a return of Goofball mode? Nope, no Goofball Mode this time. Goofball Mode as a concept comes from Kevin, the lead programmer for Alienworks. He had the idea for it, implemented it, and wrote all the jokes himself. Same goes for EZ Mode. That said, we do have a little something special planned for post-release… Although I genuinely don’t know what it is myself – it’s a secret from our programmer, minute, and the game’s co-writer, Rachel! Thank you so much for the interview, and thank you to everyone reading this! If you’d like to support us, keep up with what we’re doing, or fill your timeline with funny jokes about girls, then please consider following us on Twitter or pledging to our Patreon.